As a child, I loved kitchen equipment. My mother kept many of the small gadgets without sharp edges in a low drawer so I could play with them. An old crank-style egg beater held particular fascination; I also loved the pastry wheel with its zig-zag fluted edge. But there was one item in the kitchen that was less the source of fascination and more that of terror: the pressure cooker. Ours was like a large-ish aluminum saucepan with a tightly fitted lid that had a little pressure indicator on the side of the lid and a valve on top that a "jiggler" fitted over. When it was cooking, the thing made a lot of noise and that jiggler danced like crazy. Nothing bad ever happened (thankfully), but compared to the other typical methods of cooking via roasting, sautéing or boiling, it seemed to me a strange way to cook. These days, pressure cookers are different. Advancements in their design have made them easier to use, quieter (no more noisy jiggler) and, most importantly, safer. Multiple safety features are built into today's cookers to release pressure safely in the event of excess pressure build up. Because today's models vent less steam while cooking, they require less liquid for recipes and cook even faster. This model comes highly recommended. America's Test Kitchen rated it a highly recommended "best buy," second only to a Fissler Vitaquick model that costs $170 more. No surprise then that the Fagor Duo is the model pictured throughout America's Test Kitchen's Pressure Cooker Perfection cookbook. 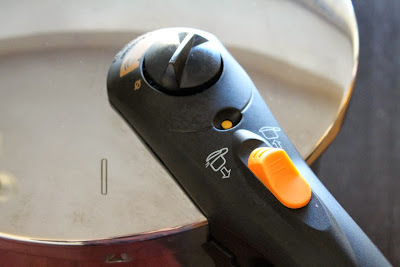 The controls are located on the lid. The dial at the top is the operating valve, which can be set to low (8 psi) or high (15 psi) pressure. It also has a steam release position (more on that in a bit) and a position to unlock and remove the valve for cleaning. The little round yellow circle is the pressure indicator. When the pot is under pressure, this pops up. When it's up, you can't open the pressure cooker. When it's down, there's no pressure in the cooker, and it can be opened. The large yellow switch is the pressure lock, which must be in the lock position for pressure to build up. 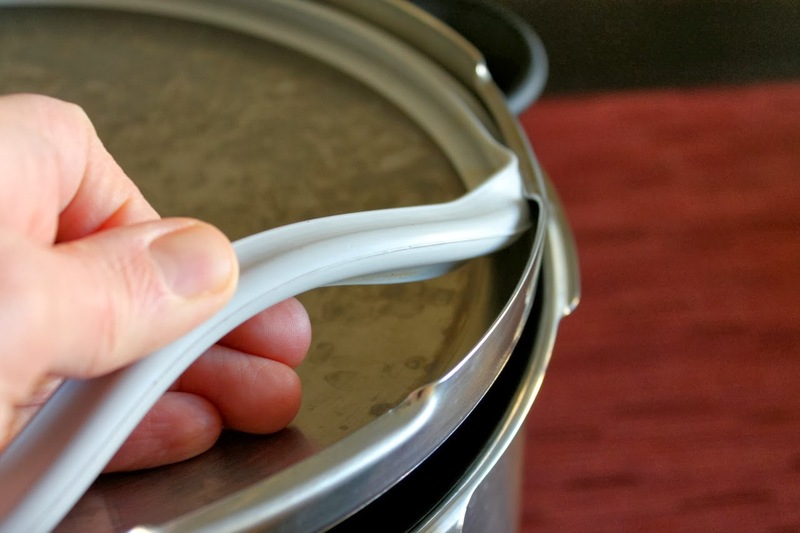 The marking to the left of the handle helps align the lid when putting it on the pot. As shown here in the top photo, the lid and pot rim are designed to interlock for a tight fit, with a silicone gasket under the lid to create an air-tight seal. As shown in the bottom photo, the gasket is removable. Be sure to get it really clean. Over time, especially if you use your pressure cooker a lot, the gasket can wear out and should be replaced. 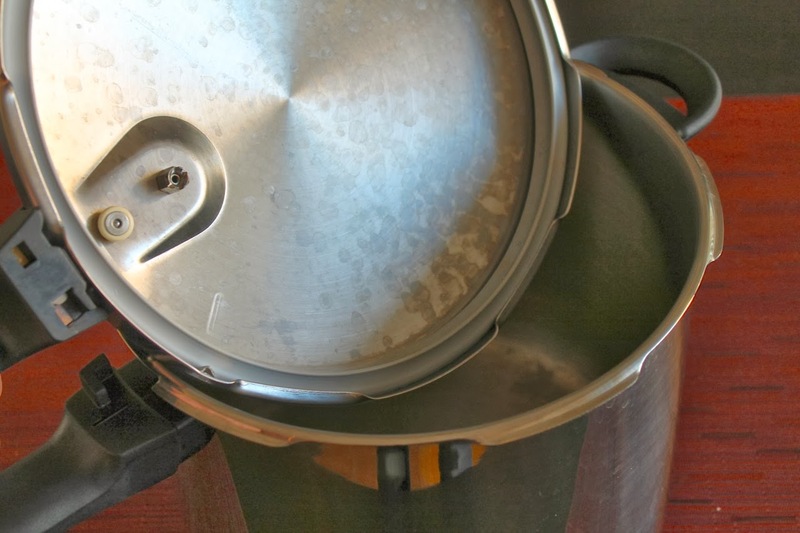 Two other items of interest under the lid: the safety valve, which is the round piece close to the handle and is the under-lid counterpart to the pressure indicator. In the event of excess pressure buildup, steam will escape through this valve. The smaller metal round piece next to the safety valve is the underneath side of the operating valve. Be sure this is clean and free of food particles. Steam escapes through this valve during cooking. The last item of note on the lid is this cutout on the side which exposes some of the silicone gasket. This is the safety vent. In the event of a high-pressure buildup, steam will escape from here, and in the event of a serious pressure buildup, the gasket will actually push through the hole or tear (obviously if this happens, it needs to be replaced). Because some cooking liquid may also squirt out if this is activated, be sure this vent is pointed away from you while using the pressure cooker. These various vents and valves are designed to release pressure in the event of a buildup to prevent the device from exploding. These measures aren't foolproof though, and it is important to follow the safety guidelines when operating a pressure cooker, such as making sure the safety components are clean and free of debris, not overfilling the pot, paying attention to signals that indicate pressure may be building up too much and never, never, never leaving the pressure cooker unattended. For more useful safety information, see Miss Vickie's post. 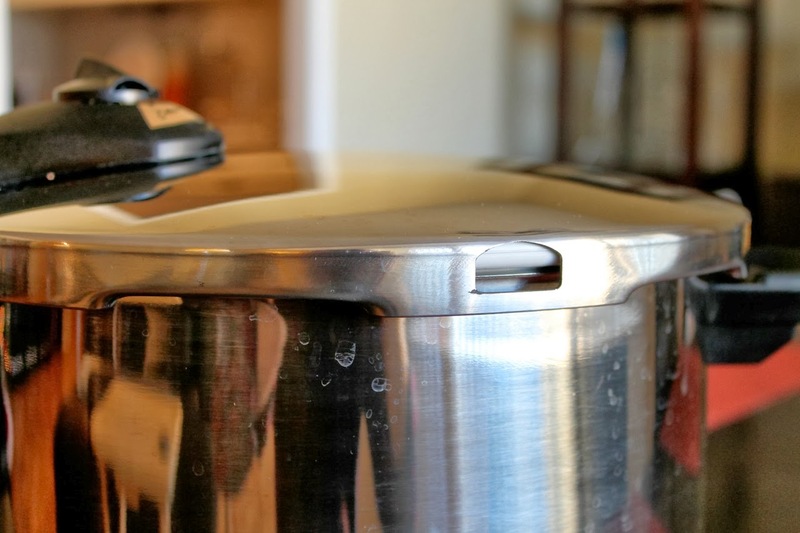 With the lid off, the pressure cooker pot is just that--a pot. A lot of recipes begin with normal stovetop cooking in the pot to brown meats and vegetables before the actual pressure cooking. Once that's done and all the ingredients are added, including an adequate amount of liquid, the lid is put on and locked into place to build pressure. Although the Fagor instructions say to heat the pot over high heat to build pressure, I always use medium-high heat, since this temperature is sufficient and, because I have an electric stove, it doesn't take as long for the burner to transition to lower heat once pressure is achieved. Once sufficient pressure is achieved, the pressure indicator will pop up. At this point, you should reduce the heat to medium-low. This is probably the trickiest aspect of pressure-cooker use: getting the pressure temperature right. You're aiming to maintain pressure. You don't want the temperature too high or you will build up excess pressure that will release out the safety valve and safety vent, which I've done a couple times. You also don't want the temperature too low, or the pressure will drop (i.e. the pressure indicator will go down). I think it takes experience to get this right. There should be a little bit of steam coming out of the operating valve while the cooker is pressurized. If that goes away, it may be a sign your temperature is too low. 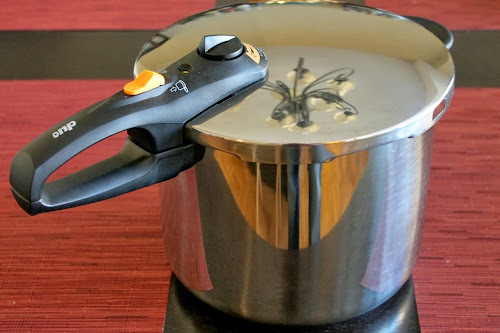 Likewise, if a lot of steam is coming out around the handle, it's probably a sign the temperature is too high. Generally, right before you reach pressurization, there will be quite a bit of steam coming out, but once you reach pressure, there is very little steam. I have had one instance of the device not coming up to pressure as expected. It should reach pressure relatively quickly--like within 5 to 10 minutes cooking at medium-high, especially if you've already been browning ingredients in the pot and it's already warm. In my case, it was on the stove for about 20-25 minutes and lots of steam was coming out, but the pressure indicator never popped up. I turned the burner off. Turned the operating valve to release steam, then removed the lid. I checked the operating valve and the emergency valve--the latter seemed to be a little sticky, so perhaps that was the problem. It's also possible the lid wasn't on quite right. After checking and cleaning those pieces, I replaced the lid and turned the stove back up. It achieved pressure really fast--like in a couple minutes--and I was back in operation. Natural release. This is the easiest: just remove the pot from the stove and allow pressure to drop as it cools down. It takes the longest though--about 15 minutes. So I've never used this method. Automatic release. Turn the operating valve to the steam release setting. Be careful with this, as steam will shoot out of the operating valve for a couple minutes. 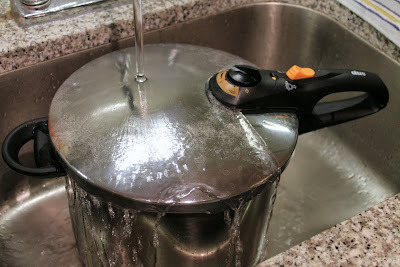 This method is useful if you are going to continue cooking with the pot after releasing pressure, such as reducing the cooking liquid for a sauce. Cold water release. This is the fastest method. Remove the pot from the stove and set it in the sink (be sure the sink is clean and empty). Run cold water over the lid until pressure is released. There's an audible hiss as the pressure is released. Be sure the water drains as you do this, as you don't want to immerse the pot in cold water. If you're done cooking, you'll probably want to use this method. It's also the best for vegetables that might overcook if you use one of the longer release methods. Be careful when opening the lid even after pressure is released, since there will still be hot steam in the pot. There's a fair amount to know about using a pressure cooker, but once you've done it a few times, you'll get the hang of it. Ready to try a recipe? Pressure-Cooked Quinoa Salad with Cauliflower is an easy place to start. Your post contains lots of helpful information, but anything that requires this much explanation scares me. It's a good thing all I have to do is clean it.